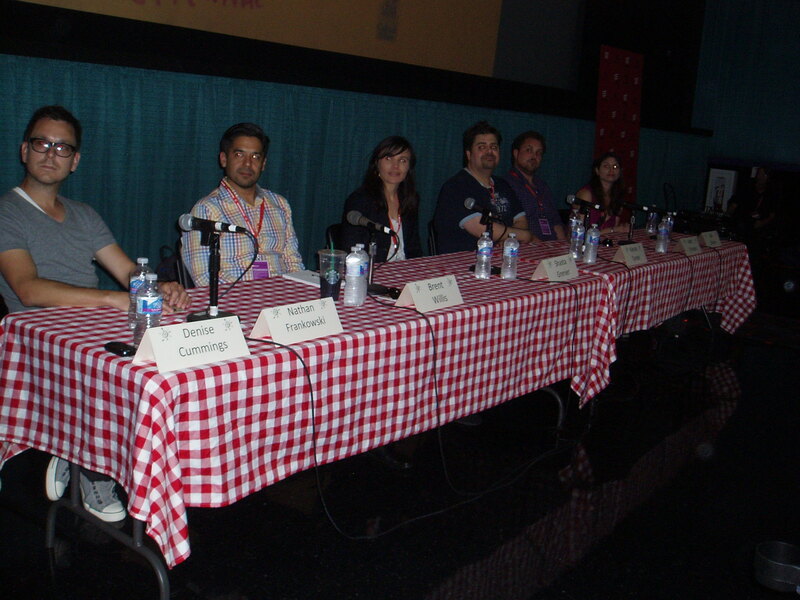 At 2:00 this afternoon, the FFF sponsored a Filmmaker’s Forum. Denise Cummings was the moderator for a panel that included, Nathan Franowski, Brent Willis, Shasta Grenier, Kieran Turner, Matt Ornstein and Sari Gilman. It’s been a long time since I attended a forum, so I’m eager to see what they have to say. The panel consists of some feature directors, some shorts directors and some documentarians. It’s a very open forum and a great opportunity for budding filmmakers to pick the brains of the panel. There are approximately 50 audience members and the FFF has two cameras broadcasting it live to anyone else who wants to see it. I’m pretty sure it will also be on the FFF website later on. We start with introductions that also include clips from the films they made. Denise begins by pointing out that all these filmmakers made films with a very compelling story. In turn each filmmaker talks about the challenges of bringing their stories to life. I ask Nathan about his previous film, which was a documentary about a very polarizing political topic, and how making a film like that–one that could have a big impact on how people view you as a person–could have an impact on your career. Nathan responds that his previous film did cause quite a stir, but it also helped him get more projects. Kieran spoke about his frustration with submitting films to various festivals who “cashed the check” but didn’t seem to have viewed the film. Another audience member asked about the budget for the films. Sari actually used “quite a chunk of my divorce settlement” to be able to make her film. Brent had an angel who loaned him thousands of dollars worth of filming equipment to make the film. However, he never told the angel that he was going to film in Japan! When he let it slip, the angel was a little surprised. Nathan talked about the support he received from lots of places in Orlando, including Full Sail University, Valencia College and the DAVE school. This blog post would become (even more) excessively long if I were to try and capture all the marvelous tidbits you can learn from a forum like this. Instead, I hope it serves to whet your whistle so that, next year or perhaps the year after, you decide to come to a filmmaker’s forum. Everyone is welcome, the education is excellent and it’s free! This entry was posted on April 20, 2012 at 6:24 pm and is filed under Art Community. You can follow any responses to this entry through the RSS 2.0 feed. You can leave a response, or trackback from your own site.